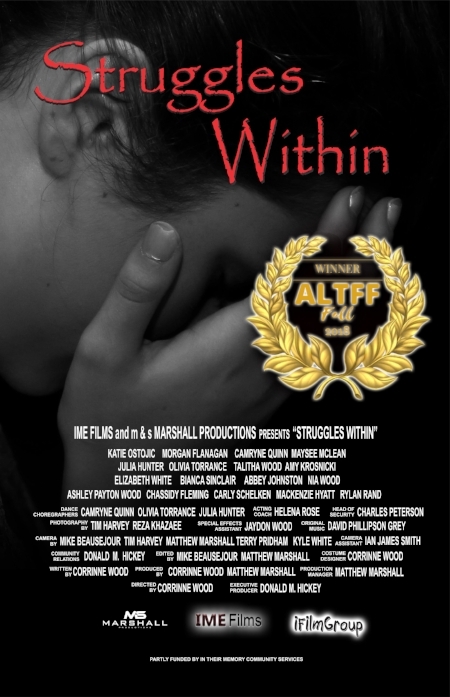 “Struggles Within” the short film which iFilmGroup helped to co-produce has won the “Best Experimental” Short film at the Alternative Film Festival (AltFF). The film which is told through dance and dramatic images with very few words has captured its first award since being released online in July 2018. The film scored the highest in its category to snag the award of the pool of nine films nominated in the category. The film is a 14 minute telling of a “story through almost all music and dance” about a girl struggling with depression and contemplating suicide. It’s about her choices to find the hope to continue to live. “The story is told through the thoughts of the main character”, Matthew Marshall one of the film’s producers says. The film is a timely story that speaks to what many people in society are struggling with. It's done in a way that words do not fill the story, but images, dance and music do, so the viewer can “feel” the story being told on screen. It also can be related to, if the person watching has had experience in their life either personally or through a member of their family with the issue of depression or mental illness. Many who have seen the film feel it shows what many people “feel” in struggling with depressions and mental illness. The film was a collaboration between IME Films, m & s Marshall Productions and iFilmGroup. Filming of the project became a story onto itself of life imitating the art being created. “The film became about this group of people who had an understanding of depression and mental illness through life experience or association with people who had been through it. The team wanted to share the message …that it’s Ok to struggle. That through talking and communication about the issue we can help each other,” says Marshall. Struggles Within was filmed and features dancers, actors and crew from St. Thomas and London. Since its release the producers have received many messages and responses from people who suffer with depression and mental illness saying how much they enjoyed the production and how much it has spoken to them. “Struggles Within” will continue to be entered into film festivals. Once it is finished the team would like to give it to organizations who deal with mental illness as a DVD that can be watched by others. “We feel that what our team has been through personally is very much what many others are going through in their lives. Because the story has almost no words everyone can relate to what is being shown on the screen,” says Marshall. The cast features: Katie Ostojic, Morgan Flanagan, Camryne Quinn, Maysee McLean, Julia Hunter, Olivia Torrance, Talitha Wood, Amy Krosnicki, Carly Schelken, Chassidy Fleming, Mackenzie Hyatt, Elizabeth White, Bianca Sinclair, Abby Johnston, Nia Wood, Ashley Wood and Rylan Rand. Struggles Within’s winning of the award marks the 88th independent film award that iFilmGroup and its production partners have won at festivals around the world. Several of Marshall’s films lead the way with most of the awards. “Tuned In” a short film won 40 awards and had 22 Official Selections and Daughter of the King (feature) won 32 awards and had 16 Official Selections. The film “Ronny’s Bench” written and produced by Donald M Hickey (iFilmGroup co-founder) is the third highest with 8 awards.